Is this all you want for Christmas? The Chinese firm is mounting an assault on the budget end of the market with the Huawei Ascend G330 landing in the UK at the start of December. 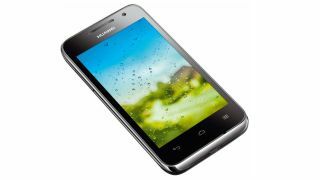 The Ascend G330 builds of the successful Huawei Ascend G300 which offered impressive specs for a smartphone sporting a £100 price tag. TalkTalk will be the first, and only, network to offer the Ascend G330 before the year is out, with other carriers promised in the new year. Contracts will start at a reasonable £10 per month, including a free handset, and Huawei expects retailers to offer the Ascend G330 for around £100 SIM-free. The Ascend G330 packs a 4-inch 480x800 display, 1GHz dual-core processor, 512MB RAM, 4GB internal storage, 5MP camera, microSD slot and comes running Android 4.0.4 Ice Cream Sandwich. Huawei announced the G330 alongside the larger Ascend G600 at IFA 2012 in Berlin, although there's currently no word on when (or if) its big brother will come to Britain.